Terry Smith has significantly outperformed the market by owning high-quality growth companies. The portfolio’s sector exposure has changed a lot. Holdings in consumer staples have been cut by 25 percentage points. See what they bought instead and see the statistics on Fundsmith’s main reasons for selling a company. Also, learn which portfolio company Smith would own for the next 15 years if he could only select one. Terry Smith or Fundsmith have not participated in the making of the article. It is written entirely based on own analysis and information from Fundsmith’s annual reports, monthly factsheets, shareholder meetings, and so on. All quotes are from these sources unless else is specified. Fundsmith has a clear philosophy and Terry Smith does a great job explaining what they do. And, just as importantly, they actually do what they promise. – Only invest in good companies. Only invest in good companies: Fundsmith’s description of good companies is businesses with a high return on operating capital employed whose advantages are difficult to replicate. Companies that do not require significant leverage to generate returns. Companies with a high degree of certainty of growth from reinvestment of their cash flows at high rates of return. Businesses that are resilient to change, particularly technological innovation. Don’t overpay: Valuation comes second to quality according to Fundsmith, but it is important not to overpay. The main valuation figure is the free cash flow (FCF) yield and they seldom look at PE. FCF is calculated after tax and interest, but before dividends and other distributions. They adjust for any discretionary capital expenditure that is not needed to maintain the business; otherwise the it would penalize companies that are investing to grow. Do nothing: Low trading activity reduces the trading cost. It also gives the investors the full benefit of the compounding effect that characterizes the companies owned. As Terry Smith says: “Don’t just do something, sit there!” This is often the most difficult part for investors. The strict investment criteria limit the sectors Fundsmith are interested in as they specify in the 2017 investor letter: “We limit it to a few sectors which have the characteristics we seek: consumer staples, some consumer discretionary products, healthcare, and technology being the main sectors.” Terry Smith, a former banking analyst, is not a big fan of bank stocks: “We do not own any banks stocks and will never do so.” Several other sectors are also off-limits as mentioned at an annual shareholders’ meeting: “We will never own a bank, never own an insurance company, never own a real estate company, no utilities, no resources, and the one thing we will never ever own no matter, whatever happens, is an airline”. There has been a clear shift in the sectors in Fundsmith’s portfolio. When Fundsmith was launched, the consumer staples sector made up almost half of the portfolio – mainly companies selling goods characterized by small ticket, repeat, predictable everyday events like toothpaste and pet food. 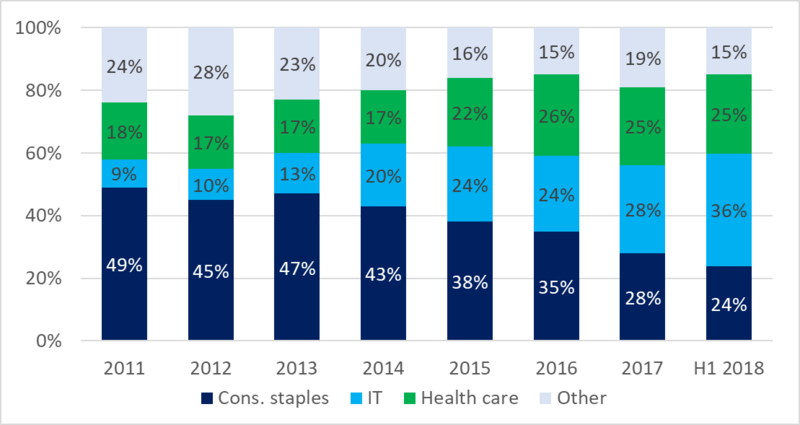 Now the consumer staples sector is merely the third largest sector and allocation to technology companies is four times as high as in 2011. The valuation of consumer staples stocks gradually increased, and the sector faces a number of headwinds. This could be a reason for the shift from consumer staples to technology companies. Several trends have challenged the major international FMCG companies. Consumers increasingly want local, healthy or organic products and many prefer either interesting niche brands or cheap private label products. At the same time, the Internet has made it possible for smaller brands to compete with international giants. Online sales and marketing make it easier for new and local companies to reach the consumer without competing for expensive ad space on TV or shelf space in the supermarket. A look at the top 10 holdings underlines the trend away from consumer staples. In December 2011, 6 of the top 10 holding were consumer staples. At the end of first half of 2018, one of the top 10 holdings were in consumer staples. Instead, 4 tech companies and 5 healthcare companies were part of the top 10. The new companies in the portfolio are still characterized by the criteria described in the philosophy. Low gearing, high gross margin, high ROCE, and growth opportunities, and so on – but the competitive advantages and drivers are different from the consumer staple companies that used to make up the top 10. One area where you must compromise when adding tech stocks to the portfolio is the company age. They have not weathered the test of time as most of the consumer staples companies have. The average age of the Fundsmith top 10 holdings has declined from 108 years to 63 years. In 2011, Microsoft was the only company younger than 70 years in the top 10. Today, 4 of the top 10 companies are younger than Microsoft and Facebook was founded less than 15 years ago. New types of competitive advantages with quickly scaled, winner-takes-all network business models make it necessary to seek companies that have not been around for as long if you want exposure to these companies. Fundsmith’s strategy of investing in companies that are resilient to technological innovation becomes increasingly difficult as technology impacts more and more industries. Even a conservative sector like tobacco is being challenged. In recent years Fundsmith has sold both the snus maker Swedish Match and the tobacco company Imperial Brands partly due to a lack of exposure to next-generation reduced risk products such as heat-not-burn devices. Another example of technology impacting in new ways is Gillette. When Fundsmith sold their stake in P&G, Gillette was the overwhelming market leader, but was ranked no. 50 in online shave clubs that utilize a direct-to-consumer online selling model. Despite the shift away from consumer staples, it is still an important part of the Fundsmith portfolio. It makes up 23.8% (end of first half 2018) compared to 8% in the MSCI World index. At the 2017 investor meeting, held in March 2018, Terry and the team were asked: “If you could own just one company in the portfolio for the next 15 years which would it be?” Both Terry Smith and Julian Robins, the head of research, chose the same consumer staples company, L’Oréal. The reason was that L’Oréal ticks the boxes of a company with a big market and with low regulatory and reputational risk. They have a number one market position in the big market but not a big market share (12% = room to grow). Everybody wants to look good, so basically, they have a market of 7.5 billion people. The company is family controlled (long-term focus) and they have good numbers. The market keeps growing – the market even grew in the financial crisis. They have €26 billion in sales, 8 brands over 1 billion and 30 great brands. They have positions in all parts of the market, both luxury and cheap. They have positions in all geographies, both in developed and emerging markets. It is extremely well run. So, the top 10 holdings have changed a lot, the exposure to IT has quadrupled and the consumer staples exposure declined by 25 percentage points. How many stocks do you think Fundsmith have sold since December 2011? Terry Smith has lived up to his “Do nothing” mantra. Large inflows make it easier to rebalance the portfolio with low turnover. However, very few companies have been sold in the period. During the 6-year period from 2012–17, Fundsmith only sold 15 companies, or 2.5 per year. If we exclude the 3 companies that were sold due to spin-offs or de-mergers, the number is 12, or 2 per year. In a portfolio with 27 holdings, 2 sold stocks per year indicates an average holding period of 13.5 years! Another interesting point is the reasons for Fundsmith to sell a holding. Despite great performance and high price increases, very few companies were sold due to high valuations. Terry Smith is more likely to sell his “losers” than his “winners.” Only 3 stocks were sold mainly due to high valuation. 6 were sold due to weakening fundamentals (business model weakening, structural issues, or similar). Another of the main reasons for selling was poor/risky capital allocation by the companies’ managers. Large M&A or investments can change the investment case. Like when Fundsmith sold Choice Hotels when they started to invest in the development of a third-party booking system. Only one company was sold due to concerns about the macro environment. Waters Corporation, a seller of analytical science solutions (mass spectrometry, liquid chromatography, and thermal imaging equipment), makes much of its sales from consumables, service, spares, and software to the operators who have installed its equipment. However, the company has significant sales to Asia and in 2013, Fundsmith became fearful that a slowdown in Emerging Markets would impact the equipment sales, so it sold the position. Two years later Waters Corporation was bought back into the Fundsmith portfolio. So, all in all, it seems as if Fundsmith has been able to diversify the exposure without compromising on their philosophy. They still buy good companies and they have a low turnover. The companies are more expensive but so is the market. According to Fundsmith, the portfolio’s average FCF yield declined from 5.8% to 3.7% from December 2011 to December 2017. The median FCF yield in the S&P 500 declined from 6.1% to 4.1%. Time will tell whether the sustainability, quality, and predictability of the newly acquired tech companies can live up to the high standards in the long term. Here is the link to Fundsmith’s Owner’s manual. It is worth a read.